where is this seminar to take place? Oakland California. See bottom left of the poster. Great job Bay Area. Let us come all together and assess our situation and talk on how to move forward. Thanks Assenna for sharing our poster. 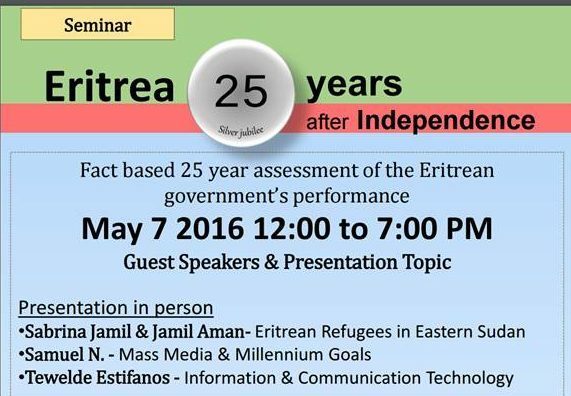 My assessment on the 25 years of the state of Eritrea as independent nation is failure in all aspects of national affairs, the grade is capital F. As a matter of fact, we have regressed back dozens of years pre colonial era, because we have lost so many educated nationals and one of the best skilled work force in Africa which is essential in nation building, thanks to this moronic,militarist minded,repressive HGDEF junta with the demented tyrant at the helm. It will take years to bring back our nation to where it was before I left home to the field.Not to mention the pride and dignity that was peeled clean off our skin and left us open to utter humiliation globally.